Osprey are soaring over estuaries and tending to platforms, Least Terns are angrily defending colonies, and broods of Piping Plovers having early success now roam the beach. Plovers, as usual, are enduring a hostile environment, where pairs must nest away from human recreation and predators while staying above the reaches of the moon tides. On a landscape where management has allowed the species to increase dramatically, but climate change slowly shrinks the thin strips of beach habitat, plovers are on edge. Broods are dodging foot and tire traffic, adults are incubating nests surrounded by large beach crowds, and other pairs are scraping out new territory after losing first nests to predators or overwash on sand not already claimed by beachgoers. With summer upon us and our shorelines bustling with activity, it’s time for a recap of a season that started when the landscape had remnant snow cover, and no birds had yet arrived. Work on the marsh began when our signature osprey platform, located across the Slocum River at Demarest Lloyd State Park, finally received a new wooden support. The weight of the now huge nest would no longer be a threat of collapse to the leaning, aging platform. A pair nested on the platform as expected, although eggs weren’t confirmed until June 8. This pair appeared to consider the platform on the Lloyd Center waterfront before choosing the usual nest. After standing empty for nearly seven years, the platform installed along nearby Giles Creek by a Boy Scout troop finally attracted an additional pair, with eggs confirmed on April 29. The question then was, did our usual pair choose this platform while another pair arrived later and chose the traditional one and its ancient nest? Was there an early predation event at the traditional platform? Sticks below the platform suggests a possible fracas. Whatever the case, two pairs of ospreys were incubating two-egg clutches as of June 8 at the mouth of the Slocum River. Nesting activity for the well-established pair at the platform on the Lloyd Woods property along Little River was confirmed on April 24 when one egg was found to kick things off, bringing the total to three Lloyd Center osprey pairs this season. This platform had three newly-hatched osprey chicks on June 8, and on June 18 two hatchlings were confirmed on the Giles Creek platform. With luck our traditional platform will also produce hatchlings, and three Lloyd Center osprey broods will be affixed with bands in July. Down on the beach, the first nesting was confirmed ironically when a nest from a returning Killdeer pair was found on April 19, in the often barren and always rocky east refuge of Horseneck Beach. Killdeer are members of the plover family that may be found well inland in residential areas, with their presence not at all indicative of a sandy coastal beach environment. However some sand exists between the rocks in the dune blowouts and provides a great backdrop for Piping Plover cryptic coloration. The refuge is also a safe haven from the myriad of disturbances present on the main beach. 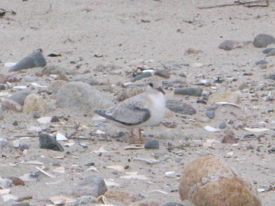 The first plover egg was discovered in this refuge on April 21, and another pair laid eggs soon after. As usual, some hatchlings mysteriously vanished in this refuge, although two are well on their way to fledging. The Least Terns are back in force in the east refuge, with the first chick found on June 17 from a colony of over fifty pairs. The terns are more apt to nest in rocky areas than the plovers, with the stability provided by all of the cobble a benefit to a species often nesting in unstable habitats prone to overwash. Least Terns liven up this stretch dramatically, as any beachgoer or researcher approaching too closely discovers! 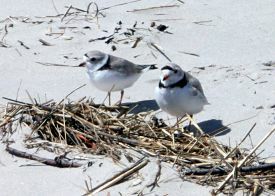 The west dune system of Horseneck is a sharp contract to the east and is currently the most productive plover nesting area on the Department of Conservation and Recreation (DCR) beaches in Bristol County. It is a natural mix of sand, light cobble, and vegetation close to an intertidal food source which the hatchlings have easy access. This optimal habitat attracted more than half (six of 11 total pairs) of the nesting pairs this season at the reservation. Some nest predation occurred in the west dunes, which was eventually inevitable given the high nest density there. Three nests were lost, including an exclosed nest which a coyote is concluded to have dug into. This pair renested and eggs were left unexclosed, with hatchlings emerging in recent days. The other two nests lost were unexclosed and predated by crow and likely coyote. The one suffering canine predation has almost completed its renest clutch, the other to start its renest any day now nearby. Keeping with the more pristine areas of DCR sites, the story remains a battle with predators. Between West Island (four pairs) and Demarest Lloyd (seven pairs at least), extensive nest loss has occurred, with six nests lost at each site. At West Island, there have been two abandoned exclosures, three predated nests, and one tidal overwash. Crow are a definite problem on the island (the one site without crow control to date). A nest hidden in the dunes remains active, and two other pairs show every sign of renesting soon. As a nice bonus, a pair has returned to nearby Winsegansett Heights for the first time in a decade, incubation well underway. We hope for the best for our Fairhaven plovers down the stretch. At Demarest Lloyd, the one exclosed nest was abandoned, five nests were predated, and a brood of hatchlings quickly vanished. Crow and possibly coyote or fox are egg predators, while avian predators such as Great Horned Owl or Northern Harrier can’t be ruled out as hatchling predators. A least tern carcass was found, a sure sign of an avian predator targeting the small colony there. The good news is that three plover nests have hatched with more clutches under incubation. A ring of nests occurred around the Demarest Lloyd sand spit for pairs seeking to avoid predation occurring in the vegetated spit interior. Demarest Lloyd is making a full nesting recovery. Hopefully, fledge success is high and productivity improves from last year. The final discussion reverts back to Horseneck, where the most cutting edge tussle is underway. On the public “main beach”, the familiar story unfolded with disturbances that include beach preparation with vehicles and some busy beach days, both preventing early plover nesting. Although nesting ultimately occurred by two pairs in busy areas of the main beach (which is critical rare species habitat under law), a rollercoaster ride got us to that point. The checkerboard of pavement and open sandy areas left when buildings were removed is basically a large “blowout” within the primary dune system that mimics the natural landscape. The area serves as a staging area for adult plovers and depending upon amounts of sand left pristine at any given time, may provide nesting habitat for pairs. The area is a viable alternative for pairs under disturbance on the main beach, and is fast becoming a preferred location. This season three pairs that may have preferred the “main beach”, instead were scraping in all of the sandy areas on the pavement! Currently, one pair has nested in the footprint of the original main facility, enough to force a road closure when the nest hatches. This situation depicts where plover management is at and where it’s going. The interests of persistent birds and people have collided head on, with plovers firmly standing their ground and not going quietly on major nesting areas such as Horseneck, when disturbances alter their nesting plans. We thank the Lloyd Center’s 2015 Plover Interns Haileigh and Nichole Nutthall (aka the “Plover Sisters”), for their long hours of hard work on the beaches thus far, as well as cooperation from the public-at-large which tolerates extensive fencing on the beaches. Tune in at summer’s end to see how the coastal waterbird season wrapped up, and until then visit the beach to see and learn about the birds!